All of us always search for a HUD that works easy and lag free and to use without reading books of instructions that are hard to understand. Mostly we had to rez our HUD’s on the ground to refill them and even then they did not work like we wanted or also had not the proper order of poses we wanted them to have. NyuNyu (Maritima Inc. CEO), made it now very simple and easy. First, you put your poses and walks in HUD contents, then you open the notecard and fill it with your pose names. Save the notecard and load it by clicking a single button (as you can see at the pic). 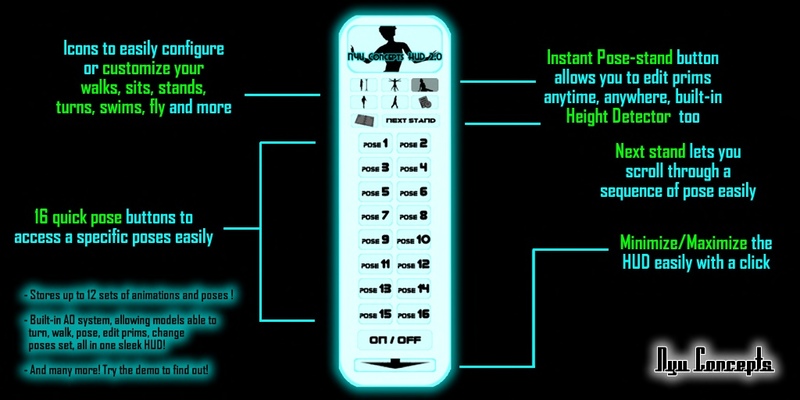 Click Height button to find your height, with and without shoes.Tthe HUD has an Instant Pose Stand so you need no extra posestand anymore. You just click the button and you can edit the prims you wanna move or resize. 16 poses plus one walk per ‘tab’ also make it easy to combine your own choreographie for every single walk you have for a show. – HUD comes in MOD/COPY, No TRANSFER permissions, meaning you can make as many copies, each containing up to 12 notecards, the possibilities is virtually unlimited! This entry was posted in Fashion, New Releases and tagged AO, Blog, Blogger, Catwalk, HUD, Innovative, Instant Posestand, metaverse, Metavirtual, Model, model pose, Modeling, Modeling pose, New, Phoptographer, Photographie, Pose, Pose Stand, Posing, Runway, Second Life, Secondlife, Sit, SL, Stand, Virtual World, Walk, Wicca Merlin. Bookmark the permalink.